#FOODNEWS: LECHON KAWALI POUTINE ? ?// Fresh out the fryer at Sauced Up in Cerritos, CA. This slow-roasted Filipino pork belly, known as, lechon kawali, is made entirely from scratch! Chopped and loaded onto fries with cheese curds, country gravy, sautéed onions, mang tomas, a poached egg, and green onions! ??? // ? @saucedupcerritos // Also, don't forget to subscribe to #FOODBEAST on Youtube ?! Be sure to tag your food photos with #FOODBEASTYOUTUBE & watch for a shout out in our next video! ?? 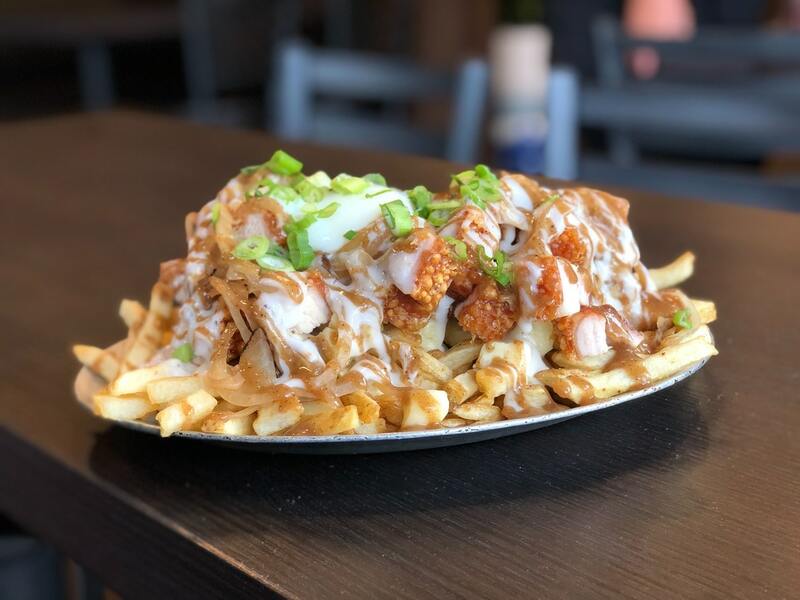 Poutineries are no strangers to adding innovative toppings to their loaded fries, but the recently opened Sauced Up in Cerritos, California, is putting a unique Filipino twist on their poutine by piling on heaps of scratch-made lechon kawali. Co-owners Mike Nocos and Romeo Manzano Jr. have a laser focus on attention to detail when it comes to quality and quantity. Such is the case with this Lechon Kawali Poutine, which features a crispy pork belly that's marinated for 24 hours before going through a slow overnight roast. A generous portion of that lechon kawali is then crammed onto seasoned fries, and from there, a bounty of toppings mix in an unforgettable combination of tastes. There's slightly sweet caramelized onions, a rich country gravy, squeaky cheese curds, acidic yet savory mang tomas, an oozy poached egg, and fresh green onions to create a poutine that is decadent yet balanced in flavor. While Nocos and Manzano Jr. have a true culinary masterpiece in the Lechon Kawali Poutine, they also have other unique toppings they stack onto their fries, such as chicken karaage, lobster, and clam chowder. There are also custom choices for the base, with tots and nachos amongst the options available. It's a unique fusion of a Canadian classic and protein options from all around the world, but Sauced Up's shining star, in our opinion, is the Lechon Kawali Poutine.